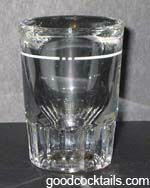 Pour sambuca into a shot glass. Layer the Amarula cream on top. Add the drops of grenadine to the center of the drink.